Pomegranates are tops, lots of fruit, little work, little water. The Pomegranate will survive on spit and curses and still give loads of sweet fruit. Punica granatum Wonderful plants do their best in hot inland valleys. And the Pomegranates will do well in the poorest of soils. Give Pomegranates just a little water and they are a great performer. Pomegranate Wonderful can be trained as a tree or left as a sprawling shrub. On their own Punica granatum plants will grow up to 20 feet tall. I prune them to stay under 10 feet so they don't break themselves down. If left on the dry side they can get quite thorny. This is great when you plan to use Pomegranates for a security hedge but not so nice when it comes time to do the Winter pruning. The fall display of fruit and yellow leaves is one of the seasonal bonuses. Late in the season they should not be watered as this can split the fruit and cause it to rot quickly.The chill requirements are 150 hours below 40° F. This is low enough that most coastal locations are adequately chilled. Punica granatum Wonderful is self fruitful and doesn't require another pollinator. There are other ornamental Pomegranate varieties that have flowers that are double red, double pink and variegated pink as well as the standard single red. There are also dwarf varieties that can be used as an accent or as a more colorful boxlike hedge. Recently there has been research into the health benefits of pomegranates. Full of antioxidants, the pomegranate can help prevent atherosclerosis and protect your cells from the effects of free radicals and oxidation. Drinking pomegranate juice can even increase the oxygen level in your heart. Remember those pomegranates for good health! And Yummm! 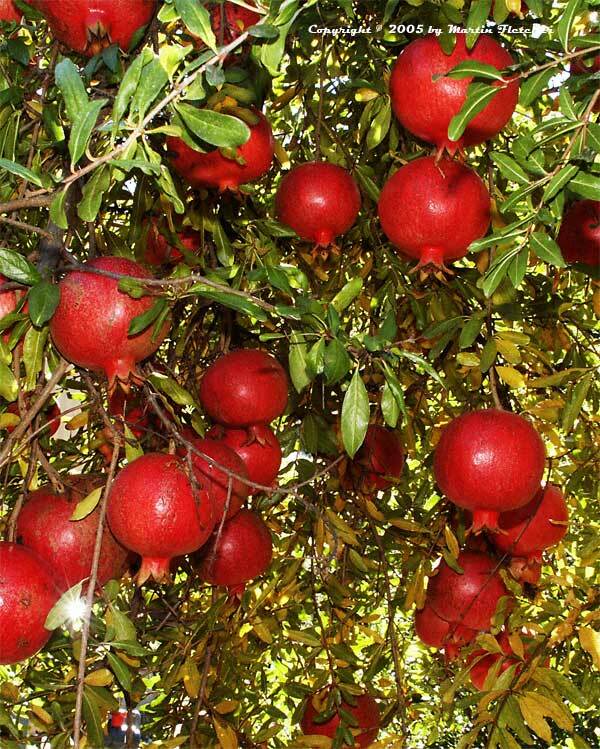 A tree full of pomegranates - Punica granatum Wonderful - Pomegranate Wonderful. High resolution photos are part of our garden image collection.